Those of you with little ones are probably familiar with this little movie called Frozen?! I mean. Really. It has taken the world by storm in a way I’ve never seen before. To say we’re OBSESSED in this house would be the understatement of the century. So naturally, with my daughter’s birthday falling just two days after it comes out on DVD, the party theme was a total no-brainer. 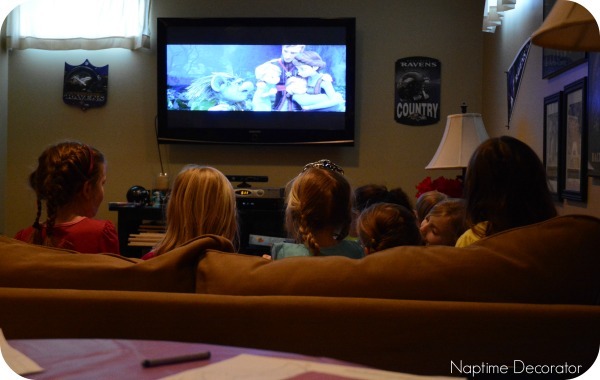 A Frozen movie pajama (but not sleepover) party. What else would it possibly be?! I decided to try a Friday night party for the first time. And turns out, I’m a huge fan. HUGE. The weekends around here come March get busy, with spring sports starting up again and all, so this worked out swimmingly. The girls arrived at 5:30, left at 8, and we had the whole weekend ahead of us. Perfect. Now, I’m not one to go all crazy wild for parties – I pick up some stuff at the Dollar Tree, maybe think of a cute craft or something, and we hang out. 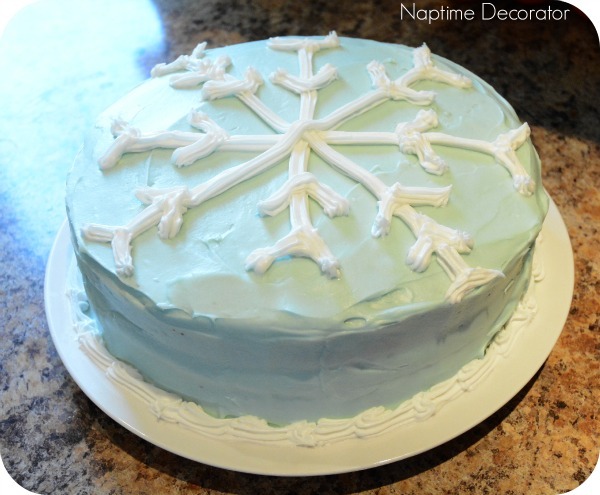 I’ve seen some AMAAAAZING Frozen ideas on Pinterest, but I like easy. And won’t break the bank. This totally fit the bill. 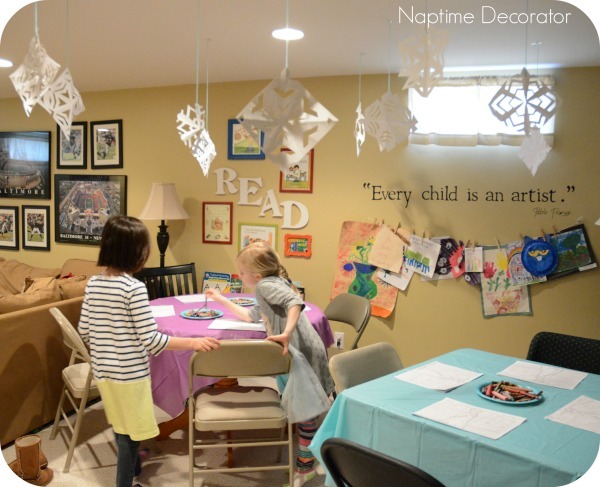 Welcome to my girl’s Frozen birthday party! It was very hard to find Frozen partyware (unless I ordered online, and I was not timely enough to go that route), so I grabbed blue and purple tablecloths, forks, plates, napkins, all that jazz. But at the last minute I decided to get out one more folding table for snacks and goody bags, etc, so luckily enough, we had a twin bed sheet in this polka dot pattern that went fine. Think outside the box in a pinch;) Since we were watching Frozen, I thought popcorn would be fun – and I bought these mini popcorn bags at Marshalls like a year ago – one of those random cute things that caught my eye at the checkout, you know? Figured this was a perfect opportunity to use them! I set up a couple tables in the basement, and that was the designated party zone. Gotta love a party that contains all the little ones in the basement and leaves the main floor free for Mommy and Daddy to hang out and have a glass of wine, am I right?! I swear, I kept an eye on them, parents – and it was only ONE glass, I promise! 🙂 I covered the tables in tablecloths, and printed each girl a pack of Frozen coloring pages. Set out plates of crayons, and we were set. I always love having a little activity set out for them, so while everyone’s trickling in, they can have something to do. Maybe that’s the teacher in me, but that kinda stuff floats my boat. 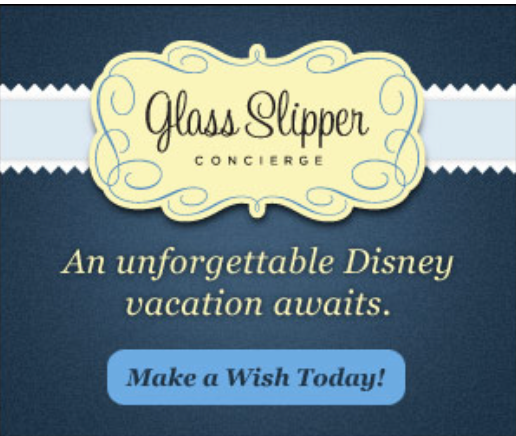 I forget the site, but google ‘Free Frozen Printables’ if you’re interested. 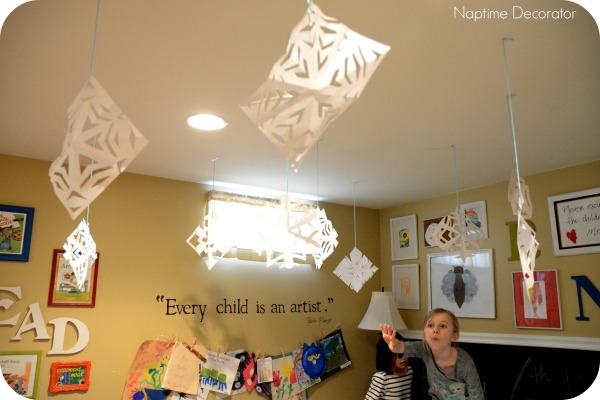 I cut out a bunch of paper snowflakes and taped them with some yarn on the ceiling. Well, that just made their day. Seriously. Paper cut out and hung from the ceiling made them SO excited. Gotta love kids. Photo idea created by that girl right there. My oldest. Piece. of. work. Speaking of my oldest daughter, I have to share this story with you. So the week of the party, I was out trying to find Frozen pajamas for both my girls. Found some in a smaller size for the birthday girl, but looked high and low for my 7 year old. NO LUCK. And I mean HIGH AND LOW. You just can’t find this stuff anywhere! Every store, even on line, sold out. So I had an idea. My friend Kristen, at Chaotic Creations by Kristen, creates the most amazing things – she’s made shirts for my kids before, and I remember her posting on her Facebook page about her personalized Frozen t-shirts. Hmmm…I asked her if she’d be able to maybe make a nightshirt instead of a t-shirt for me by Friday? We found some long/fitted dress things at Walmart, and she said she’d give it a go. And bless her heart, she had it shipped to me in time for the party!! I wish I could’ve given her a big fat hug – it’s beyond adorable, and my girl’s face when she saw it was priceless! 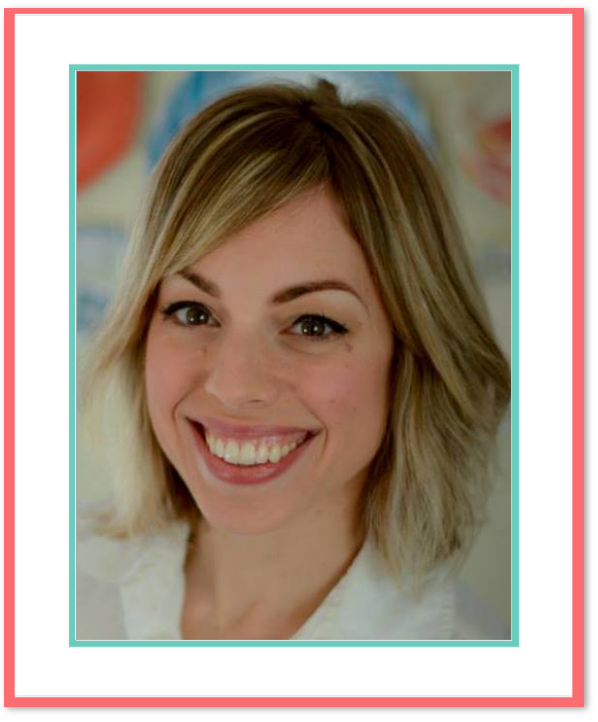 Go check out her Frozen t-shirts, or any of her incredible stuff on her website – she’s got home decor items, clothing, beach bags, you name it, she can personalize it and make it fabulous. The nightshirt was one of a kind though, since she doesn’t typically make those – but the t-shirts are equally as adorbs. And it’s GREAT quality. Ridiculously cute, right?! She’s such a talented gal. 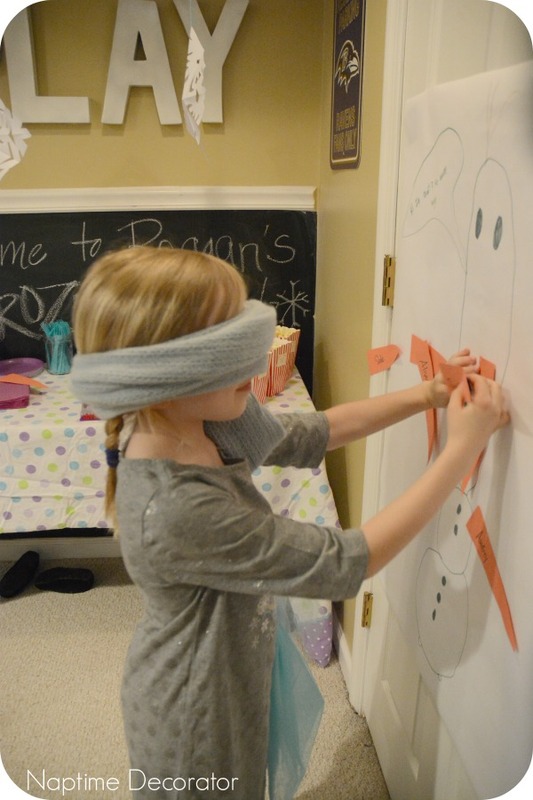 As for a fun little game for the girls, we did a Pin the Nose on Olaf. 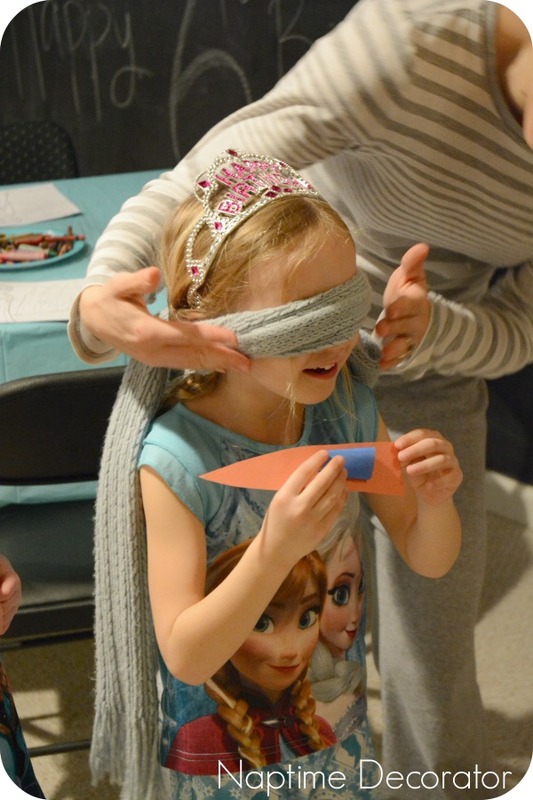 One of my readers messaged me with some ideas she had just used for her daughter’s party, and this was one of them. Thought it was adorable, so thanks so much, Kara! 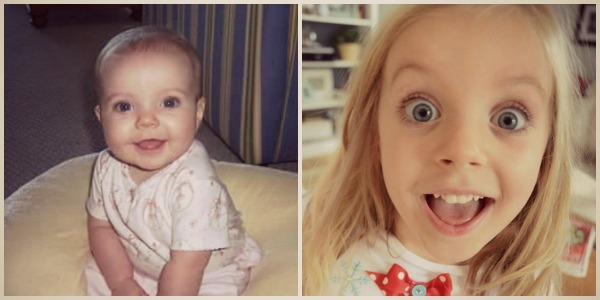 My daughter made it, so it was one less thing I had to do – gotta love that! Then it was time to eat, and I kept it simple with pizza and “snowman noses” (aka carrots). It amazed me how they gobbled up the carrots when I called them snowman noses! I could hear them downstairs, saying, “Look! I’m eating Olaf’s nose!” My plan worked like a charm…mwahaha! Movie time was next. They grabbed their popcorn and hit the couch. But, since they’d all seen it only 40 bajillionty times, that quiet movie time quickly turned into a concert! 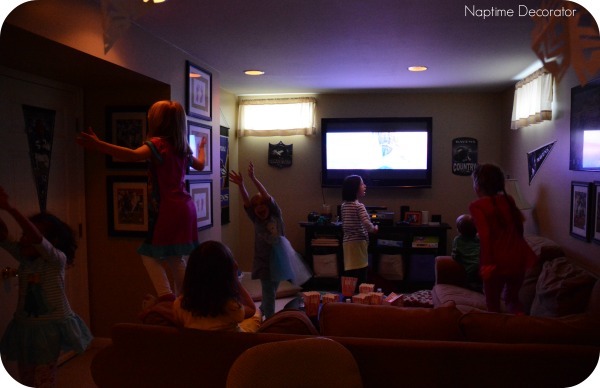 Little girls belting out “Let It Go” at the top of their lungs…so so cute. After the movie ended, it was cake time of course! We then opened gifts and shortly after, the parents arrived to pick up their girls. And the weekend was just beginning…think I might just do this Friday night thing every birthday! Six years. Not sure where they went, but it’s been an honor and delight to be this feisty, compassionate, hilarious kid’s mom. To the moon and back, baby girl. Your blog is such a delight to read! I look forward to your posts:)! 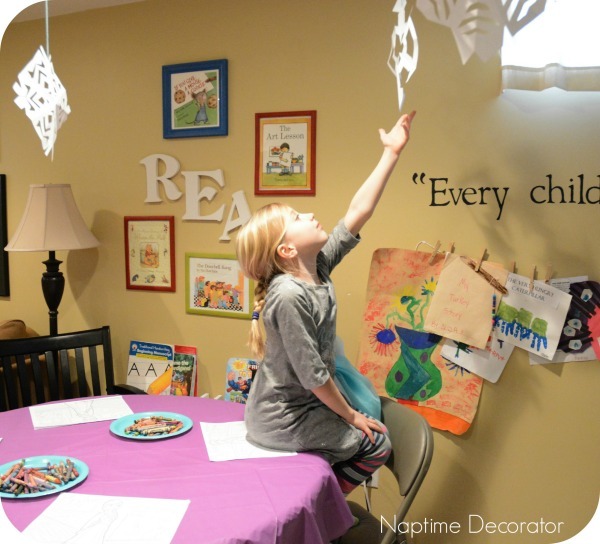 I try as many of your ideas as I can, especially when it means fun Dollar Tree finds and I LOVE your birthday party ideas! Super cute and fun but not over the top. Thank you for sharing what you love! Very cute ideas! My kids love Frozen as well! And I think she looks like you in that last pic. Beautiful! This looks awesome. How many kids did you have at the party? My kids want parties at home but the guest list is always too long for me. My oldest just turned 5 so we are still at the parents stay for the party stage. Plus we end up with siblings, too. There were 8 girls, including my 2. This is SOOOOO cute!! I had another idea to add for your readers.I have to tell you about the party I just attended with my daughter. 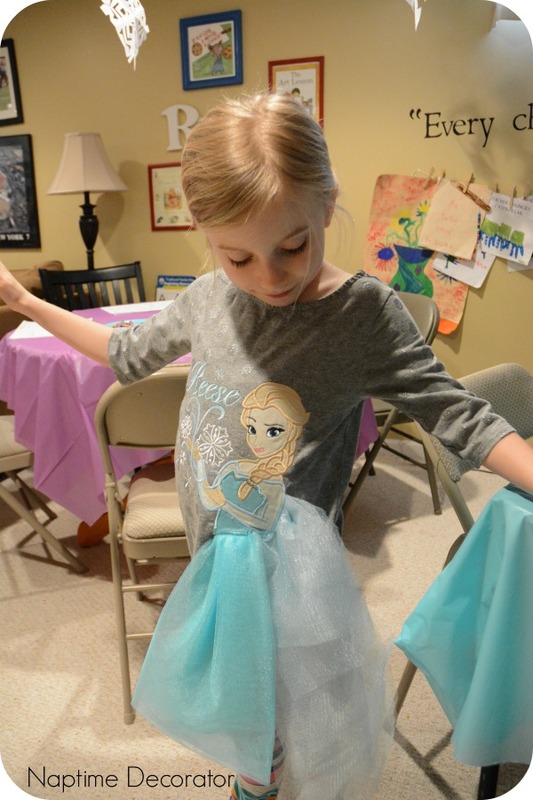 It was a Frozen themed party and included some of the ideas here and from other blogs but a unique thing that the mom did was to find an Elsa and Anna look alike to portray Queen Elsa and Princess Anna from Disney’s new movie Frozen. These 2 girls (sisters in real life) from a company out of Atlanta called look alikes and Characters Entertainment, were spot on look alikes and absolutely gorgeous girls!! Another unique thing that these girls did is to come out and actually PERFORM!! I was floored! They were SOOOOO GOOD! First Elsa came out and performed Let it Go and then Anna came out to join Elsa in a duet and perform For the First Time in Forever. Then the girls lead some wonderful themed games and activities. Then they gave the whole group of party guest the chance to come up and sing ‘Let it Go’ with real music and microphones. I have never been so impressed as I was with these girls and this party. 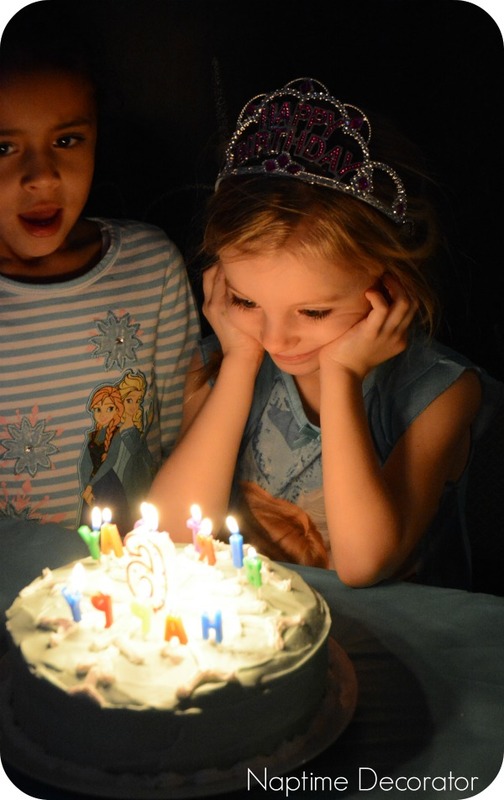 My daughter already has asked me about Elsa and Anna coming to their party in December. 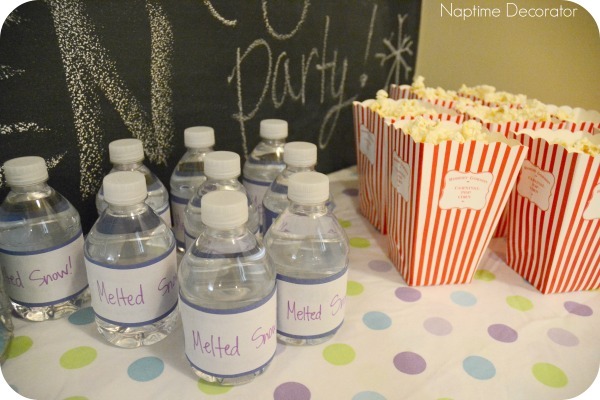 I can’t wait to start planning and using these ideas here too! Hi, I’m reading from here in New Zealand, and I love your ideas, you keep it simple and fun! Thank you 🙂 My daughter is 8 in a few weeks so we will be using your ideas for her party!